It is so lovely to be back again - I've said it before and I'll say it again ... thank you Everyone! My one big wish now is to stitch again - it will happen! My computer decided to play tricks on me and whoopee! I fixed it myself - now with a new, beaut modem and time to spare I will become the fastest one-handed typist in Australia! Back to the surgeon tomorrow and here's hoping to hear good news. Maybe he will order a special sling for stitching and another for driving. Meanwhile, I'm off visiting - hope to chat with you soon! 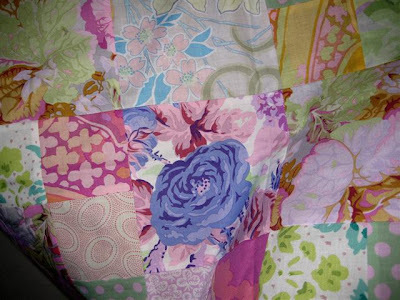 It is so lovely to chat, though no stitching to show! How beautiful are the flowers from Girlfriends! 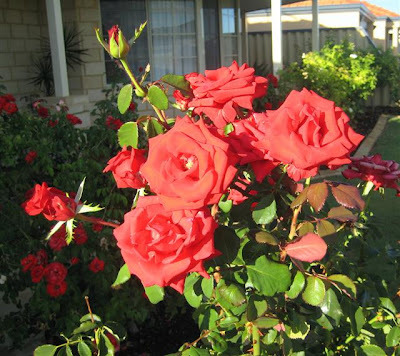 and a lovely rosebush too - Sweet Sonata - Kaffe's new book from me to me, naughty, but I love to self-indulge at times. It has been so wonderful hearing all your good wishes and kind thoughts - time to move on - all seems well on the home-front and I'm looking forward to being up to date on Replies and putting my energies into Browsing and Commenting. Julia's sweet fabrics for me pretty, pretty! 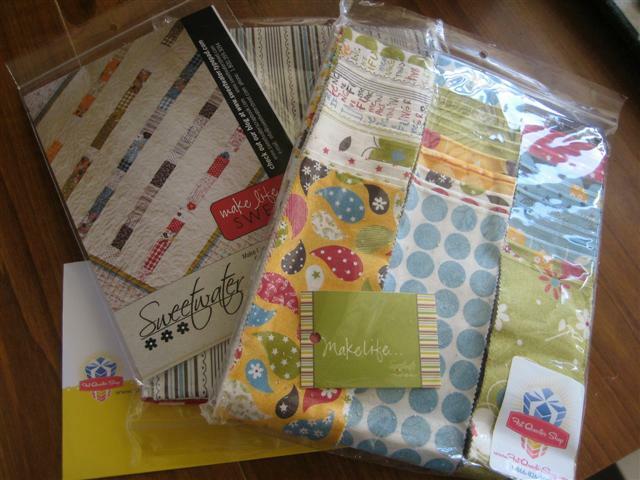 A little bit of shopping from the Fat Quarter Shop - I love the simplicity and freshness of the little lap quilt pattern - I ordered this in case I run out of things to do, lol! This is a gorgeous range 'Folklore' - 19th Century for Whistler Studios for Windham Fabrics - not really for me, but for a very, very special project. I still love the pretty, bright repros - would love to open them out and show you all, but I know this little chicken wing would have trouble putting them back neatly. Have yourself a great weekend and do lots of fun things! Hello everyone - what a wonderful day! So much has happened since I last chatted, but here we are all safe - sound? well I can say that now, but, gee, it has been a bit if a journey. In brief, my surgery went very well, far more extensive than anticipated - 5 more weeks in a sling, pain sort of under control! Ed arrived home from hospital late yesterday, in brief, it is thought that his problems are a result of radiotherapy treatment for prostate cancer 2 years ago. I have yet to read through your emails and intend to start today - I pray God you are all fine and thank you all so much! 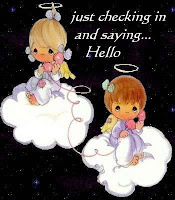 Hello to you all - sadly it will be a little while before I will chat again, please keep a little lookout for my return! DH, Ed is in hospital with recurring problem and I will have my shoulder procedure tomorrow. Meanwhile, stay well and happy - I'll have happy thoughts of Blogland and will miss you all! Life is all go - or maybe it is just me! 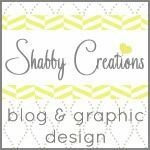 I'm rushing to get lots of little things done pre surgery and waiting for results on Ed. 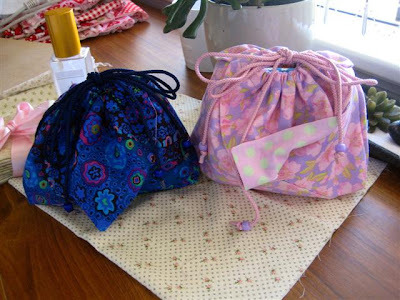 I made some time at the retreat last weekend to follow a little tutorial on Origami Bags shown by dear friend, Ann Thomson! 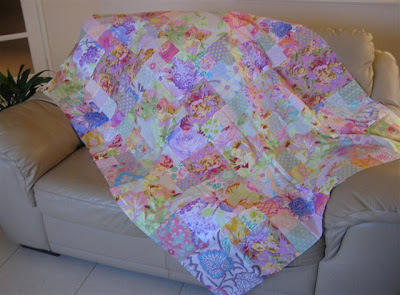 Janet, of Quiltsalott has done a tutorial in the past and you can pop along to see hers! 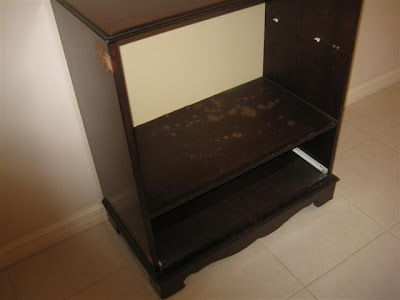 It is very similar to what I have made. I have made a couple of different versions before and of course had to be a little pedantic and take pics and measurements this time, and must say I'm a happy little Vegemite with this outcome. I even managed to make one for Girlfriend! who was there with me! 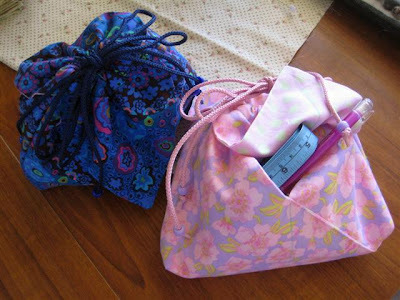 Notice it is lined and forms lovely little, pockets on the outside - add about 2 yards of matching cording and four little beads and how much nicer is this than gift wrapping paper! A very brave move - I'm serious about my Quest for Colour - DD, Danielle has taken the doors away to make a start. 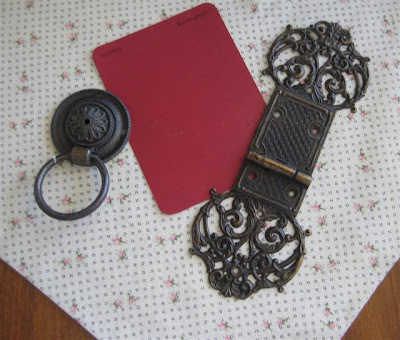 New colour 'Blushingham' and look at that gorgeous old hardware that will go back into place. 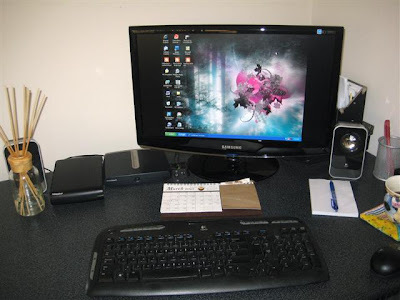 So what - just a desktop? Oh, yes, but papers in order, no unnecessary clutter, no printouts and notes strewn everywhere - wow! I feel like I have done a day's work already - off now to talk to my sewing machine for just a little while! Thank you everyone for you kind thoughts and prayers - we have little further news at this stage - maybe we just have to hope for no recurrences of the problem, but then again we may hear more news later this week and more tests may be necessary. 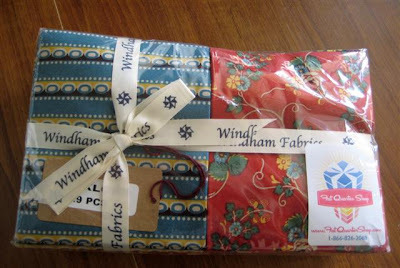 Meanwhile, let's think about all things quilty - I have been excited waiting for this parcel and am not disappointed - I looove this fabric! 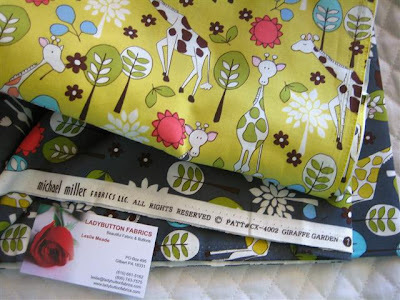 Do you ever do that - see a fabric and know immediately it is a 'must have'? Our baby twins, who turned six last Tuesday, and lots of the others of the family will see Alice in 3D today - a wonderful day is planned. I have lot of odds and ends to tidy up this week ahead - I think quite a lot of you know I am scheduled to have a shoulder implant Monday 15 March - darned sling for 6 weeks, it will clip my wings, but I will be trying very hard to flutter about. Hope you have been enjoying the weekend! Late today is the day - we may have some idea of how things are going Ed-wise! 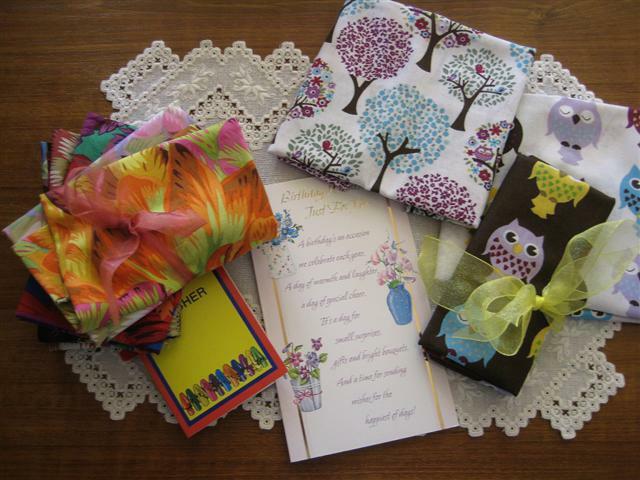 Thank goodness for the light relief of quilting and Heidi's and Byron's birthdays have come at the right time. 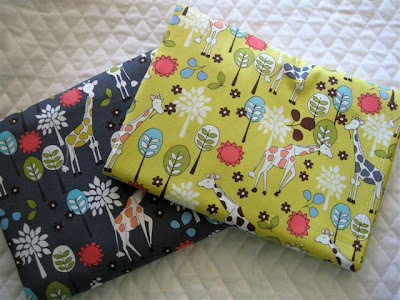 I have two quilts to be bound for them (and another two shaggies to be made!) 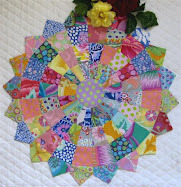 - of course the above is for Heidi - it is a jelly roll pattern! Wow! Talk about being on a Quest for Colour - I didn't mean this much - however, Byron loves it - the black and whites are puppies which he loves. I don't have a lot of luck depicting quilts for boys - I think I have succeeded here - I'm sort of glad he will be taking it home and not using it in their bedroom here. All being well, we are off to see Alice in Wonderland in 3D on Sunday, then taking the kids to Timezone (very foolish, I know, it will blow their little minds!) then a nice lunch at a nearby restaurant. The adrenalin is running - I would like to throw some magazines out for the rubbish pickup that will happen within the next hour or so - not easy, but I feel I need some orderliness at the moment! Have a lovely weekend - my goodness it is that time again! I am so blessed with so much love and good fortune surrounding me and mine! It is with a very positive attitude I am now facing trials and tribulations again - DH, Ed and I are waiting for a conclusive diagnosis and prognosis on a health condition he is experiencing and I really hope we receive the results by the end of this week! 'Til then, I know he will have thoughts and prayers from so many - thank you! I had a wonderful weekend planned and I will say it all turned out wonderful even though I missed the first day! 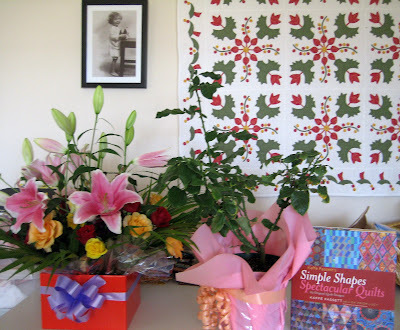 Stitching friends all enjoyed a great retreat at St John of God Shoalwater Retreat Centre - a great venue on the beach on the west coast of Australia - pure indulgence! 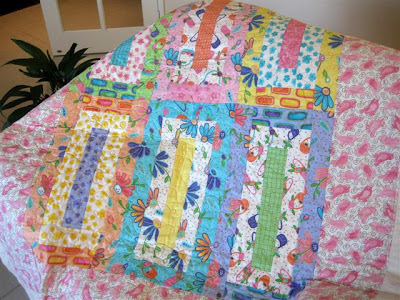 Usually I take handwork to retreats - this time I took my basket of Kaffe's and machine stitched this flimsy. 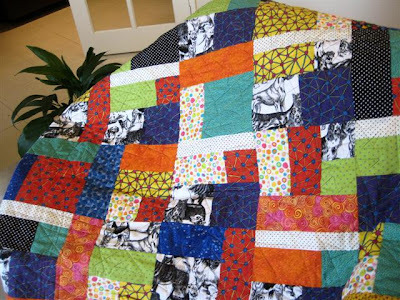 It was a great diversion inspired by one of Kaffe's designs from one of his earlier books - it turned out exactly as I envisaged, quite a large quilt and when quilted I will hang it on my family room wall to brighten up a rather dull space in my otherwise bright house. I have spoken about my quest for colour and it seems to be happening. There has been quite an injection of blue into a very lilacy-pink quilt - maybe a blue striped binding cut on bias - we'll see! 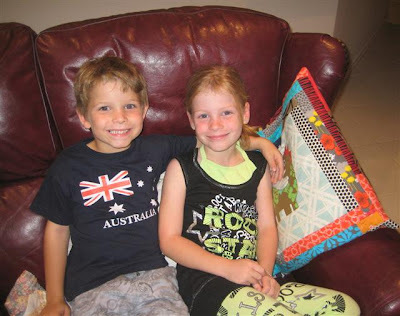 Yes, 6 years old today - Byron and Heidi - my babies are growing up - I have told them both I need more baby grandchildren now! Unprompted, that dear wee boy put his arm around his sister's shoulder for this pic! See why I love them so much! Lots of good happenings and news here, but we must away at 6:30 tomorrow for a specialist consultation in Perth in the early morning. Lots of best wishes to my new Followers and I do have some email replies outstanding - I hope to get back to replies and browsing soon. 'Til then -God bless!